Borrowed from Latin aquārium, neuter of aquārius (“of または pertaining to water”), from aqua +‎ -arium. Doublet of ewer; see also Aquarius. A tank, often made of glass, for keeping live fish or other aquatic animals. 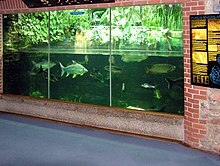 A public place where live fish and other aquatic animals are exhibited.